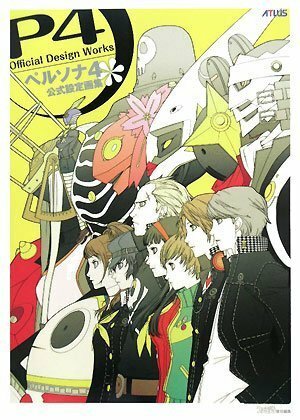 The art book for the highly rated Playstation 2 game Shin Megami Tensei: Persona 4, known in Japan as ペルソナ4 (PERSONA 4). It collects mainly the character art. They are art from various states of expression and costumes, which I think are art direct from the game. There are also some sketches for each. The style is anime-like and the characters suffer a bit of the same-face syndrome - they look rather similar if not for their costumes. Some guys are dressed as girls - pretty strange. The costumes aren't really unpredictable as they are street wear. There are also designs for the summoned Persona and Shadow (enemy). Those are definitely unique and is to the standard of weirdness you would expect from Japanese design. Towards the back are more miscellaneous sketches for the side cast. The environment (3D) art are actually just screenshots from the game. The game involves weather changes so there are several pictures of each place in different weather conditions. Most of the places are school compounds and so the visuals look pretty normal, again nothing unpredictable. They are printed rather small. This book should appeal more to fans of the game and Shigenori Soejima art. You're missing out. This game is pretty much the best in the series. I think it's kinda wrong to say they have SAME FACE. Rise and Chie sure but when drawn in that more concept art style they look even less similar. I think everyone features are different enough. I really love his style, I think I could easily say he's one of my favorite artist after playing this game. Where can I purchase this in English? (If that's possible). This book is in Japanese.